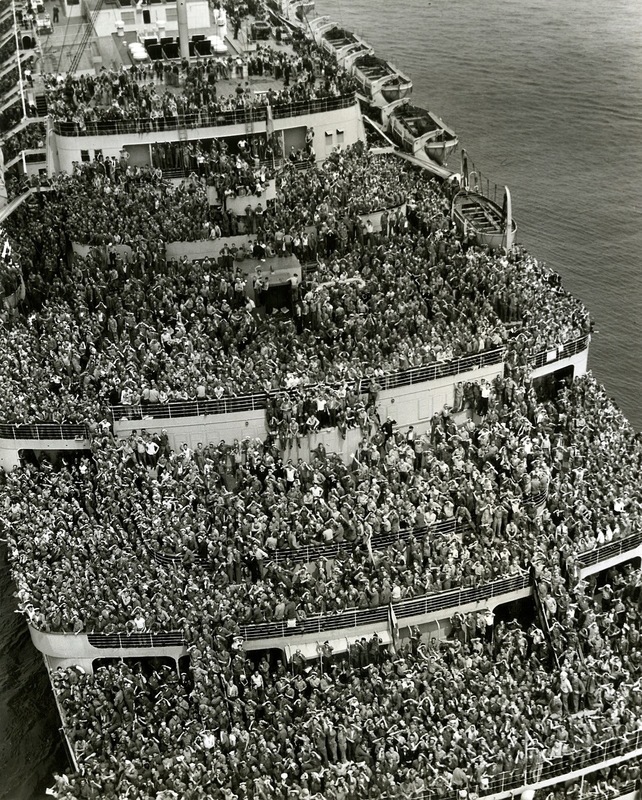 Crowded ship bringing American troops back home. This is troopship Queen Elisabeth. Queen Elizabeth and Queen Mary were used as troop transports during the Second World War. Their high speeds allowed them to outrun hazards, principally German U-boats, usually allowing them to travel without a convoy. Her carrying capacity was over 15,000 troops and over 900 crew. During her war service as a troopship Queen Elizabeth carried more than 750,000 troops, and she also sailed some 500,000 miles (800,000 km). The voyage would take about 5-7 days on average to go from the East Coast of the US to the British Isles while bringing troops to Europe. It looks crowded because everyone is on deck as it is pulling into harbor (look at the top of the picture). According to Eisenhower’s memoir some troops were complaining to the press about the slow rate at which they were being returned to the States. He got wind of this and asked a big gathering of troops at an event he was attending whether they wanted to continue filling the ships at normal capacity, or be crammed the hell into them to get home as soon as possible. They overwhelmingly applauded the later option. How did anyone find their family members when everyone got off the boat? Actually not anyone entered in contact with their family. The family likely wouldn’t be waiting at the dock unless they lived near the harbor as train transportation was actually pretty expensive. The troops would get off the ship, go to a Western Union office, send their family a telegram telling them when and how they would be getting home, and then they would get the train to there. There were other options, such as long distance telephones, but a telegram would have likely been the most common. It’s also possible for some of the soldiers not to have the money for a telegram, so they just showed up in their old town. (Photo credit: New-York Historical Society). Thank you. I am writing a novel and needed this vital information.